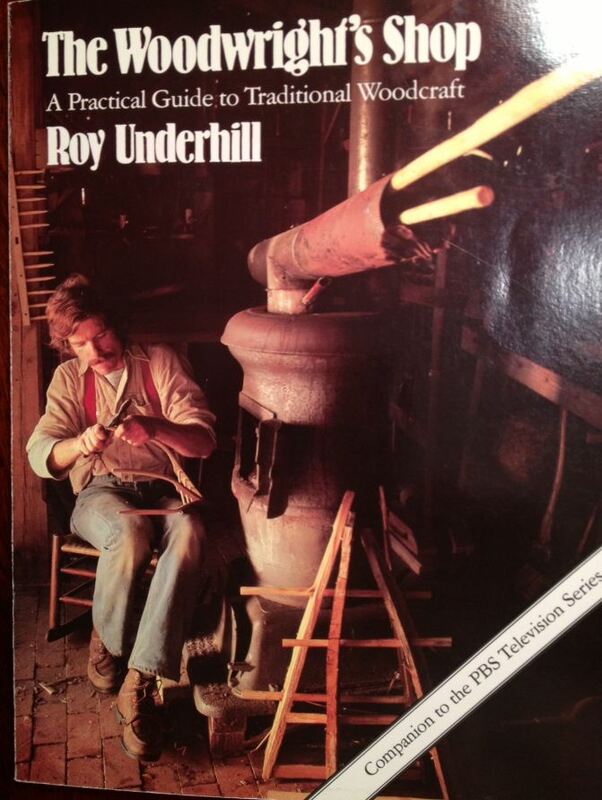 In honor of Roy Underhill’s 30th season on PBS with The Woodwright’s Shop, I thought I’d write a little something about the companion book, under the same name, this month. For those of you who don’t know, The Woodwright’s Shop is often filmed in just one take, with no going back to correct any errors or mistakes or to clarify something that might be confusing. I imagine this is partially done in order to save money, but it also perfectly exhibits one of the more important lessons one can pick up from watching and reading Roy Underhill. Go. Do. Make mistakes. Learn from them, but do not focus on them. And then try again. The show also tries to pack a whole lot of information into each 30 minute episode. Because of these techniques, the TV show isn’t exactly a complete source of information for making a shave horse or rocking chair or dovetail box. Lucky for us, Roy put out a companion book! The book follows the first season (which, incidentally, is available from Shop Woodworking, along with the second through the thirteenth seasons) in the scope of projects and techniques taught, but takes more time to explain everything in greater detail. It should also be noted that Roy is a bit more nervous in the filming of this first season than he appears now in his 30th one. Again, the book is useful for getting clarification in some of the places where his information on the show may have come across as confusing or where he was misspoken. The main idea behind The Woodwright’s Shop is to return your mind and spirit back to a time when we were more self-sufficient, a time when we couldn’t just hop in the car and go pick something up at WalMart or Target or a big box store. Starting with just an axe and a tree, we (the collective historical “we”) made our own tools and farm implements (mauls, gluts, shave horses, rakes, and hay forks), we created our own creature comforts (chairs, baskets, and bowls) and we built the house we lived in and the shed in which we stored our tools! How is this subject helpful to today’s woodworker? In developing a better understanding of these processes, we create a more intimate connection with our primary material – the wood we are using. We begin to learn what species of tree has better qualities for a specific function, whether you are chopping out a glut to help split a log (dogwood) or weaving the seat for your new rocking chair (white oak) or making a maul (hickory). This knowledge of wood properties is easily applied to the project in your garage, whether you are building it with a hand saw or a table saw. And this isn’t just a reading guide; it is a DOING guide! If you were to follow through the book and make every project from this season, you would touch upon pretty much every essential skill in woodworking. I’m sure most of us won’t go through the entire book, making every project Roy covers, but you should consider at least doing a few of them! For the most part, there is a chapter for every show of the first season. Obviously, there will be some overlap on some of the subjects covered, and a few of the subjects from the first episode (trees and tools) got their own chapters, as the topics are important enough on their own. Otherwise, it is easy to follow along with book and DVD. Speaking of… In addition to the book, something you might want to consider buying is the first season of the show on DVD. The book is marketed as a companion to the show, but maybe the show should be a companion to the book! Reading about a technique is good. Reading about it, and then seeing that technique in action, is better. The Woodwright’s Shop has many editions in print at this point; my copy is the 6th edition. This is a good thing, as it means it is plentiful and inexpensive. As of this writing, you can pick it up used off of Amazon for $5 plus shipping. While you’re at it, you might want to consider getting The Woodwright’s Companion, which is based on the second and third season of his PBS show. I’ll cover that book another day. ← Becoming More Green And… Shiny? I have two of Roy Underhill’s books and I admittedly like them better than the show. That’s not saying that I dislike the Woodwright’s Shop, but I found it a little too breathless and hurried to learn a great deal from, though you always manage to pick up a little bit of info in every episode. That being said, I think owning a complete season and being able to refer to it and pause it and rewind to pick up those little things that are easy to miss would be very helpful. So thanks for the review and the info. I think $5 on Amazon makes this one a no brainer. Yeah, my thoughts, exactly. I think I saw the second companion one for under $3 (plus shipping). I picked my copy up at an estate sale for something like $2, if I remember correctly.